When we were little, my sister and I really wanted a Christmas tree. We did not want Christmas. We had no problem with Christmas, but we were perfectly happy with Hanukkah. We liked being Jewish. We loved potato latkes and we got eight night’s worth of presents. So we never felt as if we were missing out on that score. Plus, as a religious minority, we got to partake in a fair share of Majority Culture’s fun. We sang Christmas carols in the school concert and participated in classroom gift exchanges. Outside of school, Mom let us stand in line so we could sit on Santa’s lap (we always told him we were Jewish and he always wished us a Happy Hanukkah). And our parents took us on an annual nighttime ride around the city during which we oohed and ahhed at houses and houses dressed for the season. They’d pull over, leaving the car running and the heat on, giving us time to take it all in – block after block of lights stretched across houses and dripping from gutters, lit crèches and nativity scenes, rootop Santas and pine wreaths on front doors. If the curtains were open, we might get a glimpse of the family’s tree, festooned with ornaments, boxes piled below. Then we’d go home to our darkened house. Debby and I never talked about how desperately we wanted a tree. Not to each other, and certainly not to our parents. We never spoke of it. It seemed too – blasphemous. Which was not a word either of us knew at that point in our lives. But Debby and I understood that a Christmas tree had no business in the rabbi’s living room, no matter how much the rabbi’s daughters wanted it. And boy, did we want it. A big ol’ fir tree strung with lights and popcorn chains, dripping with silvery strands of tinsel and delicate glass ornaments and maybe even candles you could really light. We were about seven and eight when we solved our Christmas Tree Lust problem to my satisfaction. (I had a genuine “shock and awe” moment when I learned much later that Debby had, for years, also been decorating a triangular tree-like object she kept hidden on a shelf in her bedroom closet). Mom & Dad regularly threw us out of the house on weekends. “Go out and play!” they’d say. It was cold and inside was nicer. But they were in charge. So we’d put on coats, hats, snow pants, mittens, scarves, grab sleds or whatever and head off looking for what to do and other kids with whom to do it. One of those days there was just us. We’d walked the neighborhood looking for other kids, but everyone was busy or not home. I’m not sure who got the idea first, but it was just past Christmas. Discarded trees were everywhere. Christian families’ holiday discards were the answer to our childish Jewish prayers! I looked at her. She looked at me. We looked around, and chose. 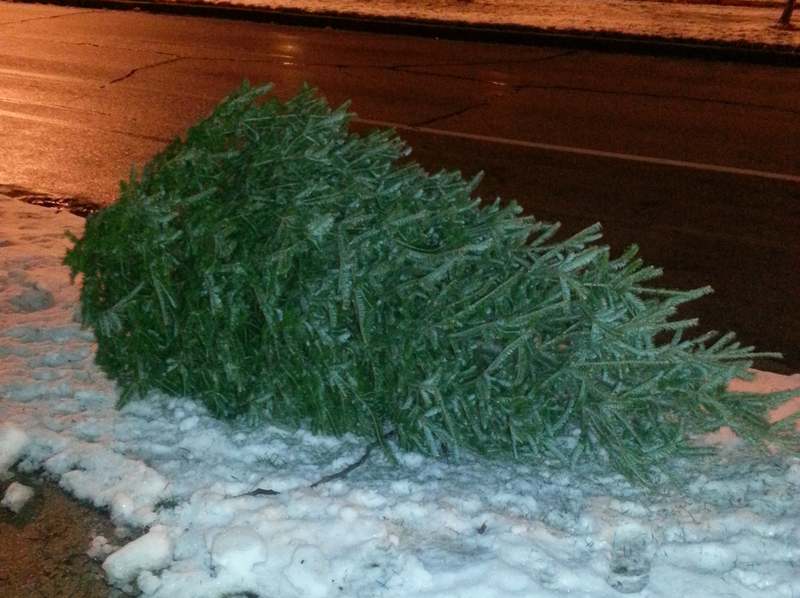 For the next two or three post-Christmas seasons, we would set out, hunting for the perfect discarded tree. We knew nothing of shape, or symmetry. We looked for tinsel, and types of needles, and whether we could get our hands around the trunk to drag it home. Then, we could imagine it had been in our living room, decorated with popcorn garlands, strung with lights, hung with tinsel and dripping ornaments. Even though I only imagined one tree inside the house, there was usually more than one laying in the road outside our living room window. We’d see one that was just too perfect to resist (particularly if it still had tinsel slung over the branches) and add it to our collection. My sister and I never talked about it. My mother and father never brought it up. Decades later, after my father was long dead, I finally asked my mother what they’d thought about it all.